The latest from Spanish director Pedro Almodóvar, Julieta is adapted from a short story by Canadian author Alice Munro that follows the title character at two stages in her life. We first meet Julieta as a middle-aged woman (Emma Suárez) who receives word on her estranged daughter after years of separation, and decides to write a letter detailing how she met and fell in love with the girl’s father Xoan (Daniel Grao) on a train years earlier. The film then unfolds in flashbacks, showing Julieta as a young woman (Adriana Ugarte), and revealing how her relationship with her only daughter slowly fell apart. This dual narrative approach allows the quiet character drama of Julieta to unfold almost like a mystery, and the film becomes more emotionally impactful as it goes along. The film is very well acted by all involved, with Emma Suárez and Adriana Ugarte both doing excellent work as versions of the same character, as we witness the grief portrayed by the older woman slowly coming to consume the younger one as well. Beautifully filmed, with a carefully balanced palate that includes many symbolic uses of the colour red, Julieta is an engagingly written drama that finds its master filmmaker in fine form. The Blu-ray also includes the featurettes Celebrating Director Pedro Almodóvar and Portrait of Julieta. 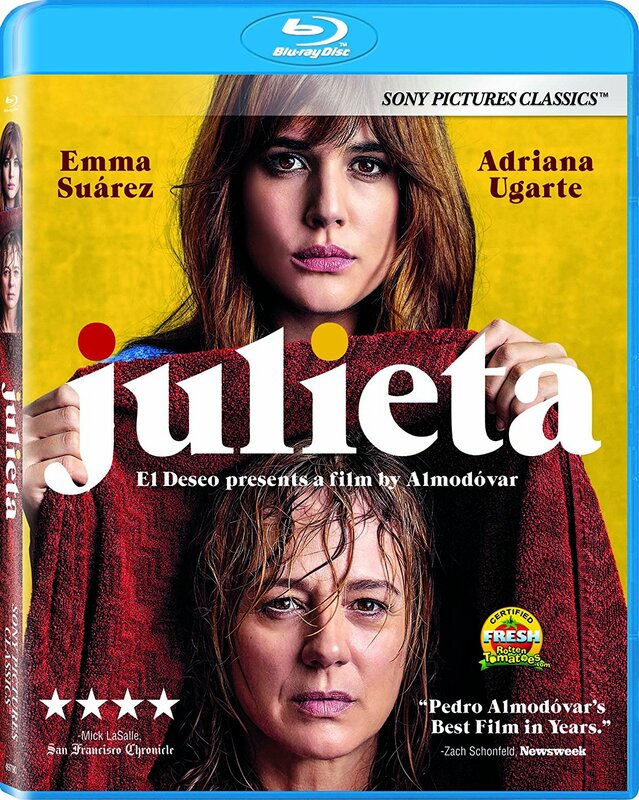 Julieta is a Sony Pictures Classics release. It’s 99 minutes and rated 14A.